Prices are rising in St Petersburg: is it true? A recent survey Worldwide cost of Living 2018 by The Economist Intelligence Unit (EIU) surprisingly (for us) revealed that St. Petersburg is the 3rd place winner in the global price acceleration «competition». The reason is obvious and simple: the appreciation of the ruble against the US dollar, the currency used for calculations in the survey. But don’t panic as the ruble has already started to depreciate and is projected to continue falling. As written in our news in January 2016, the Russian struggling economy was forced to let the ruble afloat in the end of 2014, which resulted in a 50% reduce in its price against the US dollar and the euro. The move made trips to Russia cheaper than they had ever been. 2015 and 2016 brought declines in the country’s GPD and gloomy consumers’ mood, but the year 2017 seems to have been a bit better – at least in official figures which are rather questionable. A rise in oil prices has given support to the weak ruble, and since the end of 2017 the ruble had been appreciating. This rise also affected Moscow which was ranked 8th among the cities with the fastest rising prices. «A stronger Russian rouble—partly driven by recovering global oil prices—also pushed Moscow and St Petersburg up the ranking by 12 and 14 places, respectively. Currency stabilisation, relatively weak consumer demand and a bumper harvest led to a sharp deceleration of inflation in Russia, but lower prices growth did not offset the increase in relative costs measured in US dollar terms». 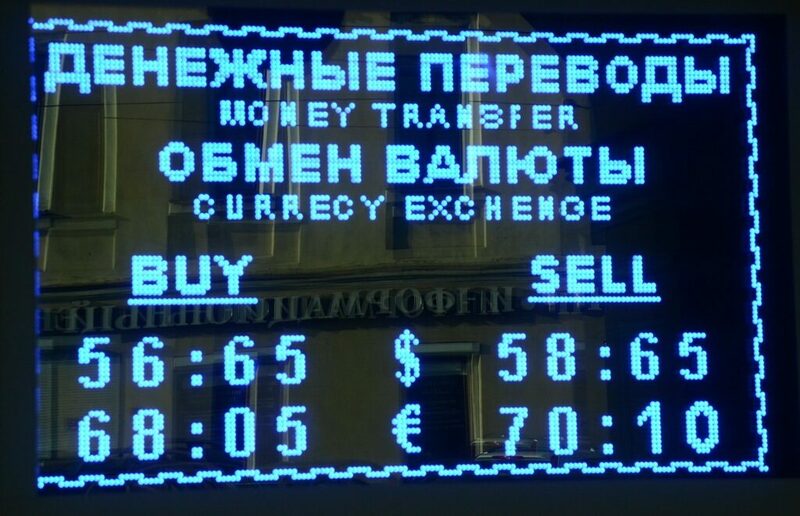 Really, the US dollar cost nearly 60 rubles in July 2017, and only 56.5 in January 2018, which represents 6% depreciation for the dollar (and in January 2016 – fantastic 78 rubles). Now, St. Petersburg is now ranked 98th among the most expensive cities to live (two year ago it was 113th), Moscow is 86th. Does it mean things are getting too costly for tourists to come here? We think no. Since January 2018, the dollar has been steadily going up against the ruble, with almost all economy experts predicting a further appreciating on the part of the American currency. Claims by the new Federal Reserve’s head Jerome Powell are only confirming predictions that the dollar will be getting stronger throughout 2018. Real also our post, if you would like to know what are prices in St. Petersburg in 2018 (in rubles).